I worked for Russ Morgan, Main Line Printshop, from 1977 to 1981. Russ had lunch at the Coverd Wagon almost every day. He used to treat us to lunch which always included several Bloody Mary’s several times a year. We had our office parties there and I do remember the Main Liners. I know that the close proximity of the building to Rt. 30 and Sugartown Road make for difficult development of the building & property with today’s state and local regulations. It is sad that a cookie cutter CVS will be built there. Hi Karen, Russ was a great customer! Like you said he came in just about every day to a Bloody Mary waiting at “his” table (a 4 top right inside the door). Renee Zambella or Platis were his servers. Great guy! very dressed up! I believe they moved from across the street and lived over the Covered Wagon after that — we lost touch of them after that. If they tear it down I will never shop at a CVS again. This is a part of history and needs to be left alone. No reason they can not use the building the way it is and they can add an addition on to it that can accommodate a drive through. Shame on anybody if they do this who shops at that drug store. Tearing down this beautiful, historical building for a CVS…what a disgrace. How many drugstores do you need on one corner? Why has the Tredyffrin Township planning commission cancelled their February meeting? The community wants to talk about this! I encourage everyone to write or call the township. What else can we do? Ideas? Interesting. My guess is that the Planning Commission had not received any agenda requests from developers, etc. I know that the CVS Pharmacy developer Summit Realty Advisors was not yet ready to come back to the February Planning Commission meeting. My hope is the reason is that they are continuing to review ‘options’ in their proposed redevelopment plan that would save the Covered Wagon Inn. I’ve got my fingers-crossed! Why do we even need another CVS? There has to be some development plan or all of the commercial landscape will be drugstores, banks and urgent care centers. What about town planning? We need that. What a treasure for sure! The Meredith family ate there a lot!!! I remember being mesmerized by the dance floor and the big band music – ladies in their pretty flowing gowns. I hate to see such a stately and historic building torn down. A CVS will certainly be an eye sore!!! History should be preserved. No no no to CVS. The covered wagon is partially in Delaware county and does not have the permission of Delaware county to do any work there! 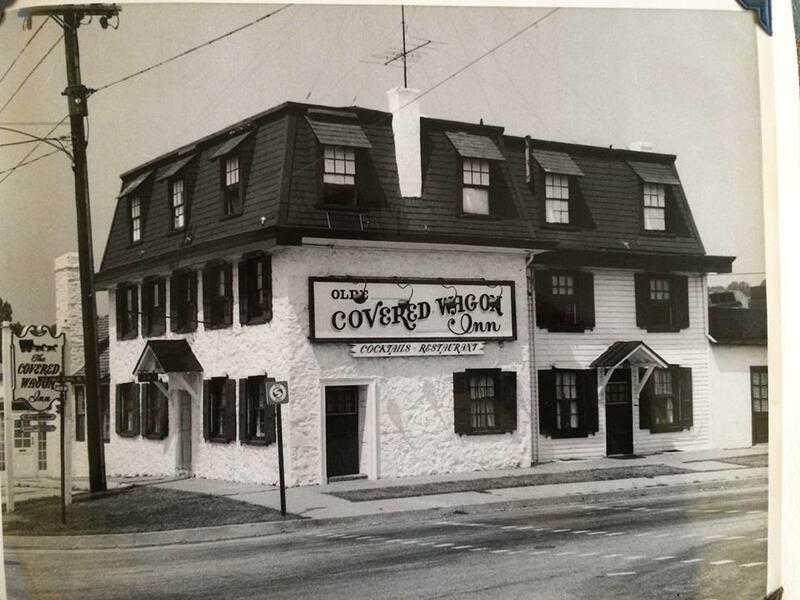 According to Tredyffrin Township Manager Bill Martin and Director of Zoning Matt Baumann, the Covered Wagon Inn is entirely in Tredyffrin Township, Chester County. I have spoken to a Radnor Twp Code Enforcement officer and he agrees that the building is not in Radnor Township, Delaware County. However, I do believe at some point the Covered Wagon Inn was in both counties. When and why the boundary line changed is still an unanswered question. I have asked a member of the Radnor Historical Society to review old maps to see if we can learn what happened. Mr and Mrs A.W. Berry were regulars there too. He owned the US Liability Ins Co on Warner Rd. My parents Mr and Mrs Chester L Chambers were permanent guests of the Berry’s. They all attended the Tinsel Ball yearly . I loved it there. We do not need more progress. We need to uphold the historical value of The Wagon! I remember Mr. & Mrs. Berry very well. Waited on them! Wonderful people! Yes, I am a child who remembers the Old Covered Wagon. It was an honor to eat there because I thought I was somebody. So you see it didn’t matter who you were, it was special. I was under the impression, you could not tear down any historical building, The Old Covered Wagon is certainly that. When you describe the area, you say, “you know right up, down or across from the Old Covered Wagon. The MAIN Line is known for many historical places, events and building…let’s not destroy that. There are plenty of vacant spots to build another CVS. All I can say HISTORY IS HISTORY and that SHOULD mean that THE OLD COVERED WAGON stays. Please WRITE/CALL TO SAVE OUR OCW. This place was so amazing to our family. Our Mother Jackie was a manager for years and step dad Antonio was a chef. Remember the awesome memories of the dance floor– As a child it was a castle. We saw Count Basie and Ella as children and had a front row seat each time. My brother, sister and myself also worked the coat room -kitchen etc growing up. This place should stay and never be taken down–It is a part of Lancaster Ave that will always have a special spot in our heart!!!!!!!!!!!!! As a former Malvern resident reading this from afar (Virginia) and not having the advantage of knowing the background, I’m confused. Did the previous owners sell this treasured landmark and now the new owners want to build a new building? Had the new owners promised to keep the historic inn and have now backtracked? Is that what sparked the outcry to keep the historic inn? Otherwise, as awful as it may be, doesn’t any property owner have the right to build whatever they desire within the law? The intent of my post is simply to understand the bottom line. Can you help? Thanks. Kathryn, there has never been any protection of the Covered Wagon Inn because there’s no historic preservation ordinance in Tredyffrin Township. The current owners purchased the property about 25 years ago and actually considered demolishing it but did not. Now the property is the subject of a land development project by CVS Pharmnacy with developer Summit Realty Advisors and they would become the new owners of the property. Their proposed plan for a CVS with drive through requires the demolition of the Covered Wagon Inn. There is nothing legally to prevent the new owners from demolishing the old building. My hope is that the developer can figure out a way to move forward with their project and save the Covered Wagon Inn in the process. As the president of Tredyffrin Historic Preservation Trust and personally owning a 300-yr. old house, I do not oppose the development project, I only oppose the demolition of the historic building to make it happen. If you page through my posts on Community Matters over the last couple of weeks, you will see that there are numerous posts, with interior photos that I took currently and more background. Hope this helps. CVS corporate will not wish to enter a new community with it’s citizens enraged at their entrance. They will (or will not) be their customers. Perhaps the way to achieve success is to petition the Corporation and not the developer who will do their thing and then be off to the next project. Thank you Patty for all of your hard work and for keeping us informed about everything happening in our community. Another OUTRAGE proposed by another greedy real estate developer with absolutely no sense of culture, history or community. I can’t believe this is even a remote notion that the good people of Strafford/Wayne would entertain. I recall so many warm and wonderful evenings spent at the Covered Wagon Inn with all the good people mentioned in the wonderful Caneda Family tribute. What could possibly replace this magnificent, historic and iconic piece of Main Line history, another strip mall? Even the consideration is a disgrace. Stand Strong. This is what type of Developement changes and demoralizes a community’s heart & soul. Hey Christine! I believe Jackie and Antonio met while working at the Wagon. Working the coat room was a right of passage if you had family working at the Wagon. My Aunt Helen ran the coat room and hosted during busy nights with the big bands. Loved your Mom, she was awesome! I have never been here and knew nothing about this place until seeing a facebook post about it just now… I have never known anyone to regret cultural and architectural preservation. CVS can build somewhere else. Thanks for posting the memories of the Caneda Family. I remember Sam. My family moved to Strafford in the the mid-50’s and my parents, Dr. Jim and Bettie Cancelmo were “regulars” at the Old Covered Wagon Inn. We celebrated many family birthdays and special occasions at the Wagon. My wedding reception was held there in 1970. Sam was always the gracious host. So many wonderful memories of the Old Covered Wagon Inn! It is a historic treasure of the Main Line. Gone is The Mile Post Inn (Lamp Post Inn) and in its place a Rite Aide not far from the Covered Wagon Inn. Is this progress? Beautifully put recollection of the history. Have to say I appreciate the memories there and don’t look foreward to a demo and CVS but that’s probably what will happen or some similar fate. Current culture is all greed based. I have great memories of Sam and Greg. The trouble Harry, Gordon and I got into at The Wagon will stay hidden in those walls. Had many wonderful evenings there. We need to preserve this historic building. We have so few left. We definitely don’t need another CVS. There is one in Berwyn. I worked at the “Wagon” for several years during and just after college. I remember Greg of course but especially Sam whom I admired for his hard work and determination and Sam’s wife, whom we only knew as Mrs Caneda who watched over the checks with an eagle eye. I remember those days with a great deal of fondness in part because my parents were regular customers (the whole family was) as I regularly ate dinners and lunches there as well as working there! I remember too when the remains of the Spread Eagle Inn were torn down a few blocks away, which had been another survivor of the old inns that lined the Lancaster turnpike in the early days of the Main Line. How can it be that an area so steeped in history can turn its back on these great and handsome relics of times past and that have made the area more beautiful and meaningful by their presence? My Dad and I have delivered many wedding cakes there in the 1970s , and having been born in Strafford, the Inn occupies a soft spot in my heart. A similar fate was to happen to my birth home before Mrs Hamilton purchased my grandfather Ludwigs’ estate in Strafford ,when my grandmother Sophie Weinrich passed. These old dwellings must certainly be allowed to continue to exist,in the grandeur that is the Main Line! I was a bus-boy at CW in the early sixties while at Devon Prep. The Caneda family gave me this first job and I loved the atmosphere on Saturday night. The band would always end with “Good Night Ladies” which meant my shift was almost done. The waiters were kind to us with their tips and the family treated us fairly. The garlic bread served all customers was to die for! CVS/Summit can develop this C-1 property and can legally demolish the Covered Wagon Inn. My family dined at the CW on a regular basis. My sister Carol Cancemo Wortman had her wedding reception in this building Valentine’s Day, 1969. Oh, we had our Strafford Eagles football banquet here. And i attended quite a few Rotary Club meetings there with dad, one of the club’s past presidents. Let’s do all we can to save this very treasured piece of Strafford! Mom and dad loved Sam. My favorite dish was the lobster scampi….we never could figure out where they got those baby lobster tails!!! Also spent my 13th Birthday there! This was my first real job at 15 years old. I came on as a dishwasher about 1978. Worked up to Pantry Chef making salads, sandwiches and shucking oysters. The history of the business and it’s building always amazed me. As it closed I transitioned to Fonzo’s in Berwyn for a short while. From that I am where I am, with great memories.